When they began organizing their conference, way back in 1963, the sponsors of the symposium, including U.S. government officials with the National Institute of Mental Health, had no idea what they would be getting themselves into. 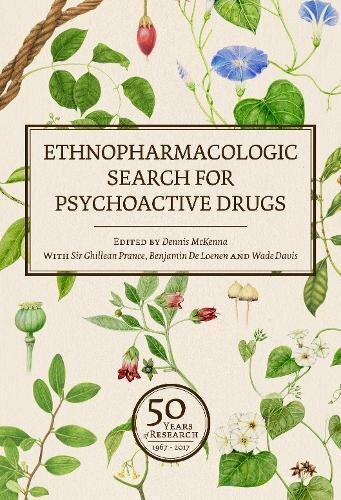 Few could have imagined just how quickly the search for psychoactive drugs would escape from government laboratories and university research centers and blossom into the hippie-infused, full-tilt-boogie psychedelic counterculture of the 1960s. By early 1967, the streets, parks and music halls of San Francisco had become the real testing grounds for those seeking psychological insight, spiritual illumination, or cheap thrills via indigenous plant medicines like peyote cactus buttons and psilocybin mushrooms, or through such chemical compounds as LSD and DMT. President Richard Nixon would soon declare his “war of drugs,” which prompted a university backlash against serious scientific research into the therapeutic use of psychedelics to treat alcoholism, depression, and other mood disorders. Both the anniversary conference and the publishing project were the fulfillment of a decades-long dream of Dennis McKenna, an assistant professor at the University of Minnesota and the director of enthnopharmacology at the Heffter Research Institute. Heffter, a co-sponsor of the new collector’s edition, has emerged in recent years as one of the main private funders for a new wave of government approved clinical trials using psilocybin-assisted psychotherapy to treat depression and end-of-life anxiety among people with a life-threatening medical diagnosis. That research, along with trials using MDMA-assisted therapy to treat Post Traumatic Stress Disorder, could soon prompt the U.S. Food and Drug Administration to recommend the de-criminalization of those psychedelic compounds when employed by specially trained therapists. This historical survey, presented in 1967 by a Swedish toxicologist named Bo Holmstedt, also resurrects the research of the German psychopharmacologist Louis Lewin (1850–1929), who summarized the early accomplishments of psychedelic research in his 1924 book, Phantastica, published more than three decades before the word psychedelic was coined. Lewin made a cross-country trip across the United States in 1887. Highlights of his psychoactive road trip included collecting peyote buttons used in Native American rituals and visiting an opium den in San Francisco’s darkly mysterious Chinatown district. Richard E. Schultes, the famous Harvard University enthnobotanist who did extensive research among South American tribes in the 1940s and 1950s, issued a warning in his 1967 presentation that still rings true today, when thousands of drug tourists flock to Peru in search of instant enlightenment via ayahuasca tea and other psychedelic potions. Others contributing papers at the 1967 conference were the early DMT researcher Stephen Szara, a Hungarian scientist who defected to work for the U.S. government; R. Gordon Wasson, a politically connected New York banker whose landmark 1957 article in Life magazine helped popularize magic mushrooms and psychedelic drug tourism; Alexander Shulgin, the Northern California chemist who devoted his life to designing new psychedelic drugs; Claudio Naranjo, the Chilean-born psychiatrist and early psychedelic therapy advocate; and Andrew Weil, the popular holistic health writer who started his career with an undergraduate expose that led to the 1963 ousting of Harvard psychologists Timothy Leary and Richard Alpert. The political and social controversies surrounding Leary, the self-described “high priest” of the LSD subculture of the 1960s, were one of the factors that led to the backlash against psychedelic research in the 1970s, 1980s, and 1990s. Widespread recreational use of LSD led to the criminalization of the drug in California in October 1966, just a few months before the conference in San Francisco was finally convened. Government and university funded research continued, but not for long. Those controversies involving Leary may have been one of the reasons that the Swiss chemist Albert Hofmann, who discovered the powerful effects of LSD in 1943, was unable to attend the San Francisco conference. In a letter published along with the 1967 research papers, Hofmann cited “reasons of company policy” for his absence. It was Hofmann’s company, Sandoz, that had made LSD widely and easily available to therapists and researchers as an experimental drug in the 1950s and early 1960s. By January of 1967, the Swiss pharmaceutical firm was worried about lawsuits and damage to its corporate image. Sandoz had also provided the synthesized psilocybin that was used by Leary and Alpert in their controversial work at Harvard in the early 1960s. When comparing the papers from the 1967 conference to those presented in England in 2017, the reader is struck by how little progress has been made over the past half-century in understanding the mechanics of psychedelic plants and psychoactive chemical compounds derived from natural sources.